Now there is CaffeMug by Neeti Gupta, Kazue Kobayashi, Jason Nawyn, Jun Oishi, Jennifer Yoon . 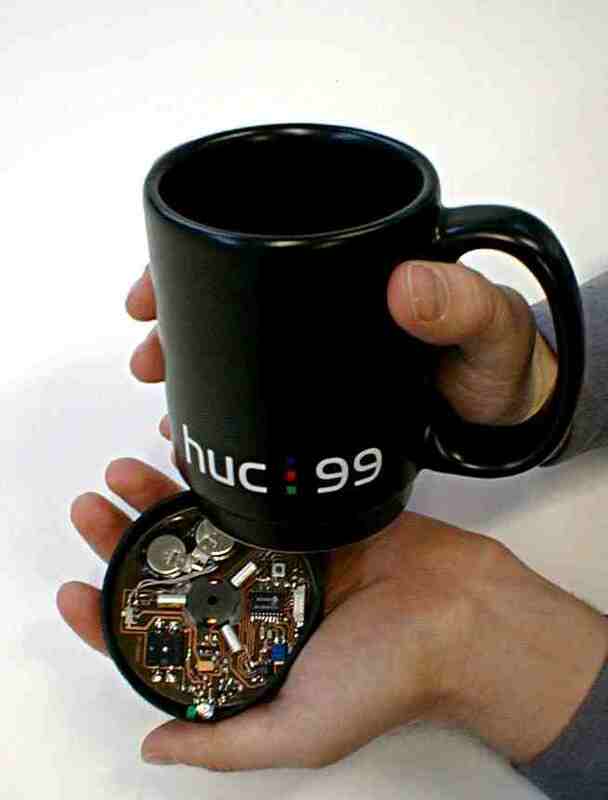 a ceramic coffee cup that has been augmented with computational capabilities to help users monitor and regulate their caffeine consumption. Caffe Mug features a visual display that consists of four circular illuminator nodes that glow in accordance with the user’s caffeine levels. The visual display provides an appropriate mapping between the accumulative process of caffeine intake and the summative qualities of illuminating multiple feedback nodes. Caffe Mug is offered as an example of how computational augmentation can transform everyday objects into agents for behavior change. With Caffe Mug, we explore the effectiveness of embedding subtle “ambient” feedback into devices that enable certain behaviors. We believe that this form of embedded feedback will play a central role in the development of more effective behavior change technologies. Roboblog: close to the blogject idea!